Built between 1757 and 1774, the Hôtel de la Marine, former Garde-meuble (furniture storage house for the Crown) is one of the most important historical monuments in Paris, not only for its façade by Jacques-Ange Gabriel, but also for its décor inside as well as its furniture  which has remained in place. 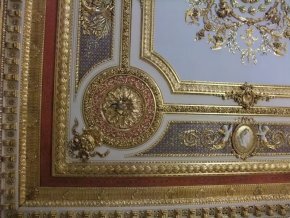 Just when its future is now being threatened (see our second article), a remarkable restoration is being completed with financing under a patronage called “de compétence”, or skilled, from Bouygues. The company provides the needed funds and ensures the follow-through and organization of the site (all for a total of 6.3 million euros), with the work remaining under the supervision of the Ministry of Culture. The project manager is the chief architect for historical monuments, Etienne Poncelet, backed by a scientific committee including notably Jacques Thullier and Bruno Foucart. This restoration has been respectful of the existing conditions and has given new luster to the rooms involved. Let us point out that this is the first skilled patronage devoted to the 19th century. The aversion for that period is still alive : rather than admiring the splendor of these décors designed under Louis-Philippe and executed under Napoleon III, the Wikipedia website (which, true, is not the best reference source for art history) writes that they were “profoundly distorted by changes under the Second French Empire” (page consulted on 22/2/09) ! 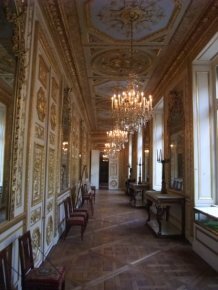 The restoration involved the façade, two of the rooms adjoining it (the Salon des Amiraux and the Salon d’Honneur) as well as the galleries next to them (Galerie Dorée and Galerie des Tapisseries). 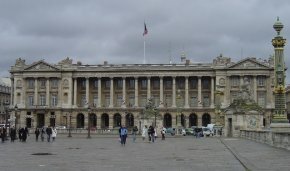 The façade (ill. 1), strongly influenced by Perrault’s at the Louvre is a precocious example of the use of iron in architecture. The building was weakened, notably during the digging of the subway line in the early 20th century and by the fact that it was built on land near the Seine. The metal stays loosened and some stones were coming off. In order to preserve these elements, an integral part of the construction even if they are invisible, a solution of ethyl silicate had to be injected under light pressure into the mortar of the limestone surrounding them. This product, until now used to consolidate sculptures, also prevents metal from corroding. 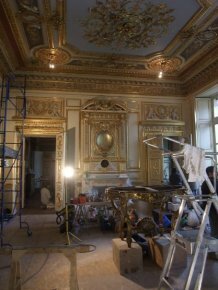 The restorations of the façade , the Galerie Dorée (ill. 2) and the Salon des Amiraux (ill. 3) have now been finished, that of the Salon d’Honneur is in the process of being completed (ill. 4 and 5). The Galerie des Tapisseries presents an interesting ceiling with a décor of fake exotic Cuban wood with a varnish which had partly disappeared. The effect of the wood knots has been reproduced (in a reversible way) with layers of glaze allowing the veins to be redone with a brush and recreating the trompe l’oeil effect originally intended (ill. 6). The other historical rooms, housing wooden paneling and furniture which is for the most part original, are not concerned by this project. However, it might have been wiser to include them. To give just one example : the 18th century Cabinet Doré, now transformed into a kitchen although most of the décor is still preserved. Still, the greatest danger comes not from a lack of restoration but from the outright sale of the Hôtel de la Marine or its rental to a private company (see our article). Read also Is France going to get rid of the Hôtel de la Marine ? When the Navy took over from the Garde-meuble, it kept some of the original furniture. Some objects came from Fontainebleau and Compiègne. 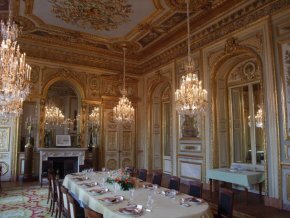 Then, after the French Revolution, Bonaparte had certain rooms restored and furniture was created by the best artists of the era (Jacob, Marcion, Molitor…). Tapestries woven at the end of the 18th century (Indian Suite, after Desportes especially) were installed and are still there today. All of the successive political regimes, from the Restoration to the Third Republic, contributed to the furnishings. 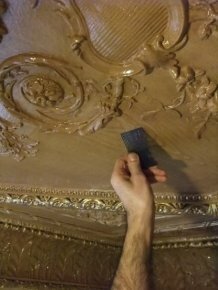 We would like to thank Monsieur Jean Ducros, Secrétaire general of the Association des Amis de l’Hôtel de la Marine, for pointing out these historical elements concerning the Hôtel and its furniture. On the other hand, the tympanum sculpted by Michel-Ange Slodtz was replaced with a copy then discreetly and scandalously destroyed during a “restoration” dating from the late 1970’s. Next article in Heritage : Is France going to get rid of the Hôtel de la Marine ?